Not to worry. We are inundated with milk and have been making things with it all winter. And soon — yes, soon — I’ll write about some of that and the interesting ups and downs of home cheese making. For now, thought, I’ll give you a small sampling by telling you about yogurt. As far as the milk goes, you can use whatever type of milk you prefer: cow, goat, full-fat, low-fat, even dry milk. I’ve used the following recipe with whole goat milk and with 1% cow milk. If you use goat milk or low-fat milk, the resulting yogurt will probably be thinner than the cow- or full-fat milk version. I like both textures, and the thinner variety is great for making sauces, but you can also thicken thin yogurt by straining it as you would when making yogurt cheese. Use a few tablespoons of store-bought yogurt that contains live cultures; read the labels on yogurts available at your grocery store, and try to find a brand doesn’t have any additives or extra ingredients; it should just contain milk and live cultures. Use a prepared, dried starter culture available from cheesemaking supply houses like New England Cheesemaking Supply Company or Dairy Connection. You can also find yogurt cultures (and yogurt makers) at many natural/health food stores. Once you’ve made your first batch of yogurt, you can reserve a few tablespoons of that yogurt to start the next batch (much the same as when you’re using a sourdough starter to make bread). 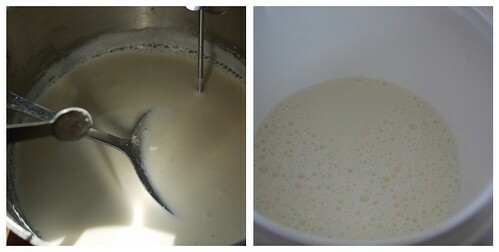 The basic process for making yogurt is to heat the milk (which pasteurizes the milk to kill any harmful bacteria and also changes the milk proteins so that they can form the thick, smooth texture of yogurt), cool the milk to a temperature that the culture bacterias happily thrive in, add the culture, and then incubate the mixture for several hours at a constant temperature so that the bacteria can do its work. 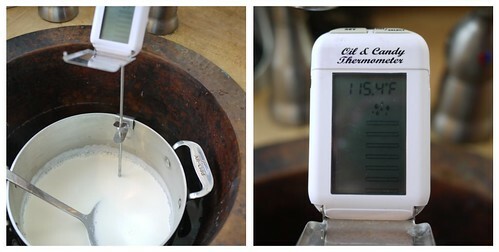 During the incubation period, the goal is to keep the cultured milk at a constant temperature (around 105-110°F). If you live in a warm climate and your home stays at a pretty constant temperature all day or overnight (whenever you’re incubating your yogurt), you could probably get away with covering the pot of cultured milk and maybe wrapping it all in a towel or blanket to keep the heat from escaping. Constant mild temperatures are not a feature of living in Vermont, but it’s easy enough to fake it. I’ve heard of people putting some warm water in a cooler, then putting the the prepared milk in a mason jar and putting the jar into the warm water bath, then closing the lid. Other people use thermoses, or mason jars or pots sitting on heating pads. If you like electric gadgets, you can buy an electric yogurt maker that keeps the temperature exactly where you set it, with the added benefit of making the yogurt in darling little individual-serving jars. 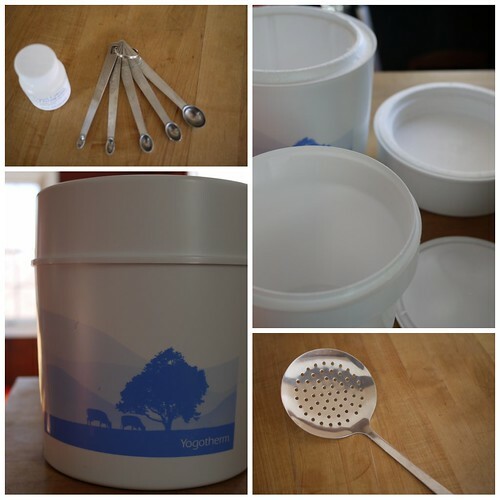 Finally, you can get a yogurt maker like this, which is essentially just a washable plastic insert that sits inside an insulated container. No electricity needed. This is the yogurt maker we opted for. Okay, enough build-up. Are you ready to make some yogurt?! Collect your equipment and ingredients. 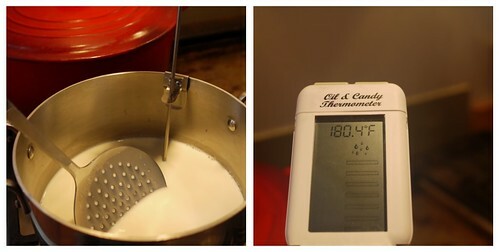 Gently heat the milk to 180-185°F. You can do this directly on the stove, or in a double-boiler. I’ve read that if you hold the milk at 180 °F for about 10 minutes the resulting yogurt will be thicker, but I haven’t tried that yet. Whichever method you choose, keep an eye on that temperature and don’t let it get too low. You want the temperature to end up in that window where the yogurt culture is happiest (around 105-110°F). If you cool your milk slowly and a skin forms on top, remove the skin before adding the culture. Add the culture to the milk and stir it in gently, but thoroughly. 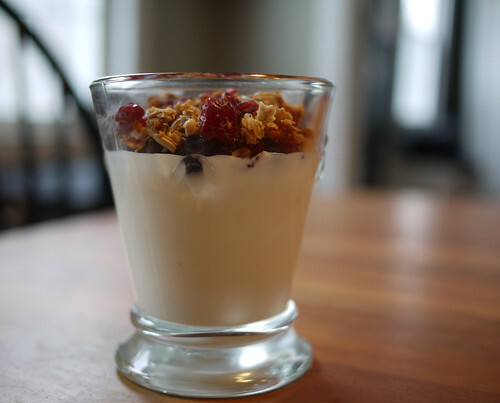 If you’re using yogurt as your culture, stir in 1-2 Tablespoons of yogurt. 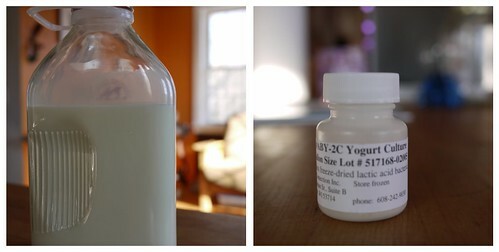 If you’re using prepared, dried starter, follow package directions for the amount to use (I use the ABY-2C culture from Dairy Connection and add 1/8 teaspoon for 1 quart of milk). Pour the cultured milk into your yogurt maker (or cover the pot if you’re incubating in the pot). If you’re using a non-electric yogurt maker, you can pour hot water into the maker to pre-heat it (empty the hot water before you put the cultured milk into the yogurt maker). I also like to sanitize the inner plastic container by rinsing it with boiling water before I put the cultured milk into it. Let the yogurt incubate for several hours. The incubation time depends on the texture and flavor you want. Generally, a shorter incubation period (5-6 hours) yields a thinner, sweeter yogurt; a longer incubation period (8-10 hours) results in a thicker yogurt with a tangier, sour flavor. Once the incubation is complete, chill the yogurt. 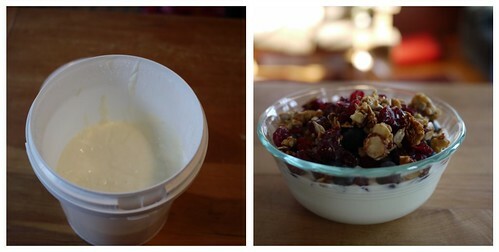 The yogurt is now ready to eat and should last in your refrigerator for at least a week. This is a well-timed post, at least for me. Since I had success with creme fraiche a few weeks back, and then butter, I have decided to start dabbling in dairy again. I think I have finally figured out the best way to incubate my yogurt without a machine so I hope I will FINALLY make this a habit. It’s great to have these tips. Maybe I’ll try it with goat milk one of these days. I just reordered some rennet to try to make cheese again–I had some false starts but these other recent adventures have gotten me curious to try again. I’m looking forward to your cheese posts! Hi Sara – So glad this is helpful for you! It really is easier than it seems to make many of these basic dairy/cheese recipes. I can’t wait to hear what cheese you try next! I’m going to try the 30-minute mozz again–but when I feel comfortable with that I want to try goat cheese! Hard to imagine how it could be better said or presented. Great job! Thank you so much for your kind words — and for inclusion in your DIY Spotlite site! Hi, I accidentally incubated my yogurt 18 hours… do you know if it’s safe to eat? That’s interesting. I’m curious where you saw that. What about things like creme fraiche, clotted cream, etc? Those sit out for well over 10 hours. At least creme fraiche I think is similarly cultured, but is the buttermilk culture different enough? I probably leave mine out 9-10 hours, I’ve only been making yogurt about a month now (and much thanks to your inspiration to get me trying it again!) so I don’t have tons of “data” per se. Thanks for making me think this out a bit more! I tend to be very conservative re: dairy. I just did a little more research to confirm what I’d read before. To clarify, longer incubation periods are probably safe if you’re able to maintain a safe temperature (~100 – 110 degrees F) to keep “bad” bacteria at bay and allow the “good” bacteria to proliferate. Yogurt cultures are thermophilic cultures, which are happy at higher temps, so you need to keep the incubation temps up to keep the culture active. I’ve never made creme fraiche (shocking! but now I must, thanks to you), but doesn’t that use a mesophilic culture (low temp)? That may explain the difference. All that said, incubating the yogurt for more than 10-12 hours will probably result in a very sour yogurt (nothing wrong with that), but I’d smell it first, then taste a tiny bit and see. I can certainly believe that there are people all over the world who incubate and use yogurt and *never* refrigerate it. I hear you on squeamishness. Check out the recipe for clotted cream in “Canning for a New Generation”–that just sits out for long stretches of time, unincubated! Creme fraiche is SOOO yummy. I use it (or yogurt) instead of sour cream, per Joanne Chang’s recommendation! Or just on fruit. I shoudl try making it along with my yogurt in the cooler to incubate it faster. Will do! I love using yogurt in my baking and cooking; creme fraiche would be wonderful, too. I’m afraid to make the clotted cream, but only because I’d eat it all! !